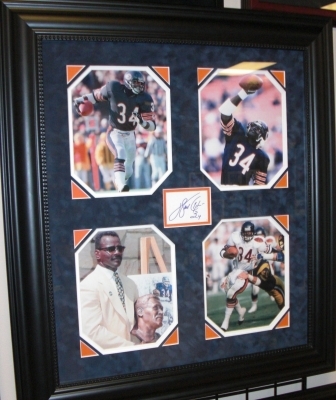 Walter Payton has personally hand signed this 3x5 card with a Blue sharpie pen, and it comes Beautifully custom framed and Triple matted. The Mahogany wood frame measures 29x33 inches. The double matting consists of a Navy suade/velvet top matting over a white bottom acid free matting, in the corners are an accent of Orange Matting. Perfectly custom framed to go in any home, office, or sports room. There are 4 of the best Payton's unsigned photos surrounding the 3x5 hand signed card. This custom made frame is ready to hang on the wall! This item comes with a numbered Online Authentics.com authenticity sticker on the autographed item, which you can verify online once you purchase it at Online Authentics.com, which is one of the top third party authenticators in the memorabilia industry. This item also comes with a REAL DEAL Memorabilia Certificate of Authenticity (COA). Get The REAL DEAL.